Can Bolivia Achieve Equitable, Sustainable Extractivism? Of course NOT!!! 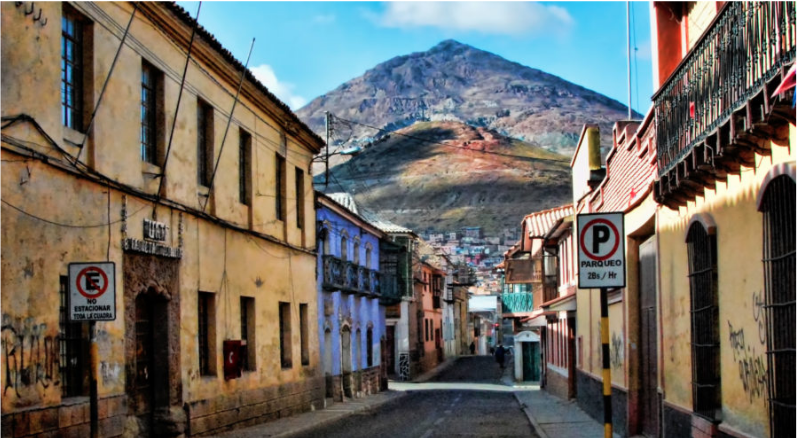 Can Bolivia Achieve Equitable, Sustainable Extractivism? Evo Morales has been the President of the Plurinational State of Bolivia since 2006. The term “Plurinational State,” adopted by the 2009 constitution that President Morales himself helped formulate, explicitly describes the country not as a nation-state but as a solidaristic union of diverse ethnicities. More than any other president in modern Bolivian history, Morales has implemented policies that have improved the lives of millions of Bolivia’s indigenous people. Historically, there has existed a vast socio-economic gap between the country’s largely urban white population and its traditionally rural indigenous populations. This gap was maintained by brutal military dictators throughout the twentieth century up until partial democratization in the eighties. Being an indigenous Bolivian himself, Morales has sought to integrate indigenous people politically by encouraging participation in the social movements that have formed the activist base of his party, the Movement for Socialism (MAS). In contrast to other “Pink Tide” Latin American states like Brazil and Venezuela (Pink Tide refers to the former hegemony of social democratic governments across most of Latin America) which have collapsed into political crises in the past two years, Bolivia’s political coalition has survived to the present, but not without the development of significant contradictions that endanger its continuation. Especially since his third election in 2014, President Morales has been devoting increasing political capital to the authorization of gas and mineral extraction projects across the country and their financing through contracts with mostly Chinese firms. Ostensibly, these projects have been justified as necessary for developing Bolivia’s economy, as the profits from the nationalized extraction sector are explicitly being devoted to social expenditures such as infrastructure, wage increases, and education. Many indigenous activists from the movements which composed the original base of MAS, however, criticize extractivism on the grounds that the revenues of these projects will largely be channeled into Chinese and multinational firms through sub-contracting, with what remains for Bolivia being distributed to the white and growing indigenous upper classes. The government has rebutted this by claiming there exists no other way to maintain Bolivia’s regionally spectacular growth rates amid falling commodity prices. Falling government revenues could encourage the MAS or a future government to borrow capital from the IMF or the World Bank, loans which would require cuts to social spending amounting to a termination of the Bolivarian political project. 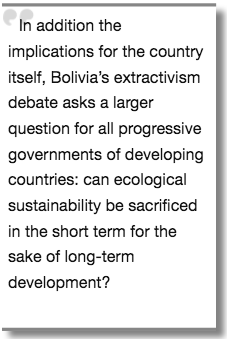 In addition the implications for the country itself, Bolivia’s extractivism debate asks a larger question for all progressive governments of developing countries: can ecological sustainability be sacrificed in the short term for the sake of long-term development? The main argument made by defenders of extractivism is that the industry is necessary to sustain Bolivia’s meteoric economic growth. To provide some background, the decline in commodity prices, especially for minerals and gas, has caused a fall in revenues for the state-owned extraction sector. To compensate, the government maintains that expanding extraction to recoup lost revenues is necessary. Moreover, the profits from extraction are being channeled into counter-cyclical public spending in the form of wage increases and pensions for public sector workers. This theoretically allows increases in domestic consumption, which in turn cancel the effects of economic contraction, thus avoiding the types of recessions faced by both Brazil and Venezuela, while directly bringing the benefits of extraction to the Bolivian working class. It is for this reason that even radical Bolivian intellectuals such as Raul Prada have called for a dichotomy between “predatory” extractivism and “indispensable” extractivism. While the environmental costs of extraction are acknowledged by most of its supporters, they also insist on recognizing that extraction forms an essential component of the Bolivian economy. Because of this, some claim that the true debate is not between pro-extractivist MAS supporters and anti-extraction environmentalists, but rather over the degree to which extraction ought to be extended to protect Bolivian economic sovereignty and in doing so ultimately protect the rule of Morales’ environmentalist government. Many in the opposition, including a significant minority within the MAS, reject this narrative. Their central argument is that for its veneer of good intentions, the government is nonetheless furthering its own interests at the expense of the weakest within the MAS coalition: poor indigenous communities and disempowered minorities. As a matter of fact, environments are destroyed as a result of extraction, and this destruction directly harms the health and material wellbeing of native peoples and non-native small-farmers. The ecological damage is by and large “inalterable” on the local level, and ultimately contributes to the global fossil fuel industry and by extension global warming. In this manner, extractivism has become a focal point for environmentalists in the global North and South. Beyond the general environmental issue, detractors of extractivism also charge it with reinforcing structural inequalities and deepening authoritarianism. Women, for example, are systemically excluded from the full gains of extractivism. According to the anthropologists Nicole Fabricant and Bret Gustafson, of the few jobs created by extraction, “Most are semi- and high-skilled jobs that generally go to men.” The distributive gains from extraction in the form of cash transfers, “reach women as mothers and wives.” This is to say that the bulk of social expenditures specifically allocated for women go to women working in positions already income-dependent on men as husband/fathers, rather than to single, working women. And even the transfers to mothers are “small compared to expenditures on the military, universities, regional governments, and municipal governments.” Similarly, while extraction has improved the lives of workers in the formal sector of regulated employment, Bolivians working in the informal economy have gained little from the minimum wage and public sector pension increases paid for by extraction. As a result, the informal sector has consistently included “about 65%” of the Bolivian workforce throughout the last decade despite promises that extractivist profits would be invested in a future non-extractivist, socialist economy where all workers would have legal representation. Regardless, many Bolivian activists recognize the faults of extractivism and see no reason why they cannot be addressed, but they question the logic of an anti-extractivist versus extractivist paradigm. Bolivian political writer Federico Fuentes argues that the issue of extractivism in the abstract conceals the real conflict between “governments that do the bidding of transnationals and imperialist governments, and peoples’ governments trying to…break imperialist dependency.” In essence, all South American economies are in some ways dependent on extraction (as are most post-colonial economies generally). The issue for activists ought to be how to use extraction to create economic sovereignty and thus break with dependency on both the global North and on the fossil fuel economy. He reinforces this with the claim that “almost no one proposes closing down all extractive industries,” as this would create a catastrophe. The variety of views most Bolivians have on extraction means there are no concrete extractivist or anti-extractivists platforms, only a space for debate among the Bolivian people themselves. Fuentes does not shy away from making an argument from realpolitik on behalf of the MAS. He writes, “A view of South America that only sees extractivist governments and anti-extractivist rural indigenous communities is blind to the struggles of this majority.” Silencing the voices of the urban working-class and the many rural communities which depend on extraction funded social services would be tantamount to excluding them from MAS. This would turn the once country-wide coalition into a singularly environmentalist party, an act which would effectively hand the government over to the considerably more right-wing opposition which, if in power, would not hesitate to privatize extractivism. The anti-extraction purist line, in Fuentes’ words, “runs the risk, in the name of saving some trees, of destroying the entire forest.” The possibility of a hard-right “coup” government with connections to the United States has been made conceivable since the historic fall of the Brazilian Workers’ Party, a hegemonic force in the country once thought to be unshakable, and following the turmoil in Venezuela which President Morales and many MAS activists perceive as the work of American espionage. Anti-extractivists have responded to this criticism by taking up their own anti-imperialist line. As extraction becomes less profitable amid falling commodity prices, the Morales government has become dependent upon deficit financing from Chinese firms to pay for the expansion of Bolivia’s national infrastructure, much of which is contributed to the needs of the extractivist economy. Whereas a fiscally independent government would be capable of self-financing national development projects and thus grow the economy outside of dependency on any extra-national creditor, Bolivia’s government has consistently needed to borrow increasing amounts of Chinese capital despite growing interest rates. Even though the conditions of Chinese loans and contracts have been far less austere than their neoliberal counterparts in the Global North, the Bolivia-China relation will bring the former to a total foreign debt equivalent to 50% of its GDP following a new credit deal of $10 billion. Detractors claim that for all the anti-imperialist slogans of MAS, it is in the process of delivering the country into the hands of Chinese finance. Extractivism will continue to be a contentious issue within Bolivian politics. President Morales will have to resolve the contradiction within MAS between the staunch anti-extractivists and the redistributive extractivists before the MAS faces the 2020 election. The debate will determine the economic as well as political future of the country. If the MAS extractivist line is held, the country will continue developing its extractive capacity, more likely than not while expanding redistribution of the profits. If the strict environmentalist line is held, the country may commit itself to a new economic vision the results of which are impossible to predict now. There also remains the possibility of a right-wing resurgence the sort of which experienced in Brazil and Argentina, wherein extraction could be re-privatized. Whatever the future, this issue within the Bolivian left displays the all too often occurring contradiction between development and sustainability. How this tension is dealt with is in the hands of the Bolivian people. Bolivian Thoughts opinion: Such a long and at times tedious lecture with an ending that doesn’t’ say much … very soft, irrelevant that undresses the author’s preference for the left, for the socialist ideology that has not shown success anywhere else in the whole world! evo is a populist demagogue who sold his nomination as defender of indigenous rights, mother nature and said that they were the moral reserve of humanity … well, dozens of examples, on a yearly basis appeared that clearly portray him as a demagogue liar! The author’s arguments come from a boiler plate that neglects how pernicious and damaging have resulted all the “socialists of the 21st century” … he purposely minimizes and rumbles without acknowledging the facts that made the Kirchners, Lula/Dilma abandon the power. evo is no different, he wasted over $160 billion dollars without creating a single sustainable job and pissed away the best economic times in our history! This site is full of examples about his ineptness!